Last weekend, Singapore food bloggers celebrated an important event. 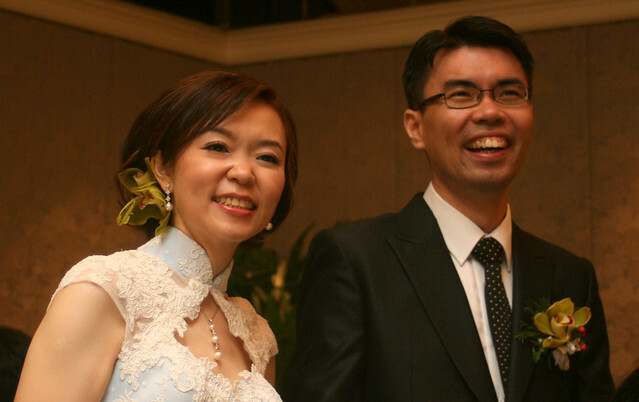 Keropokman wed his longtime sweetheart Momo. Don't they just absolutely look radiant together? I know, I promised Keropokman I would keep most of the photos private, but this one is too good not to share. There were a great many friends at the wedding and the dinner, including KL bloggers A Whiff of Lemongrass and Fatboybakes. The atmosphere was filled with joy, warmth and love. Happiness makes food so much more enjoyable, don't you think? And the food at the Mandarin Oriental was pretty good to start with. I liked that the dishes were a little more on the traditional side. I miss old school wedding dinners! 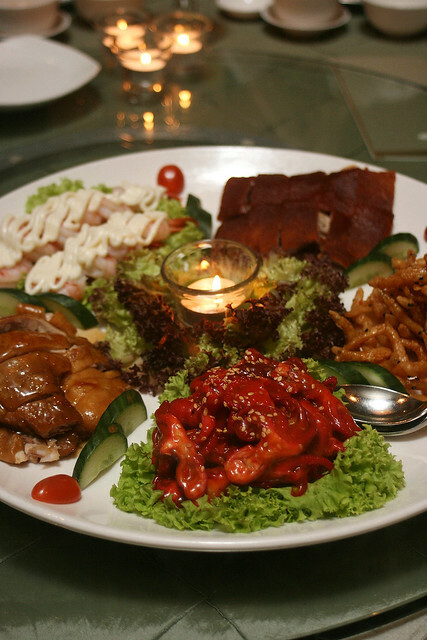 Mandarin Oriental Combination Platter - suckling pig, silver bait, baby octopus, soya chicken, prawn salad. I'm a sucker for cold platters, and this one had suckling pig. Instant win! 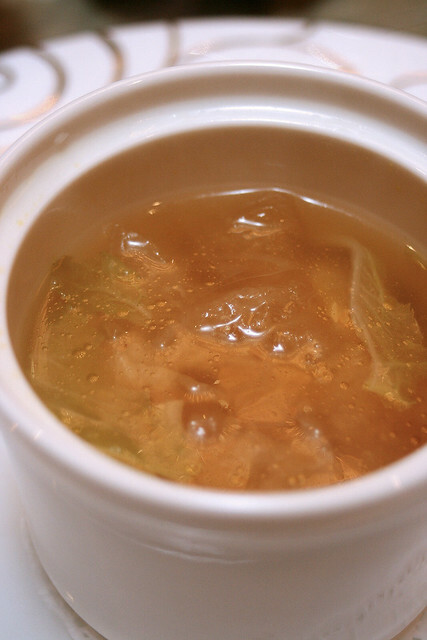 Superior Soup - double-boiled with five treasures. No shark's fin in here. It was very tasty with full-bodied seafood flavours. 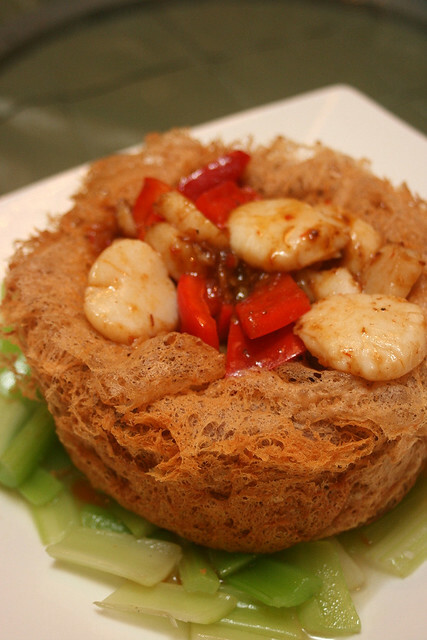 Scallop Wok-Fried with Celery in Yam Basket. Deep-fried yam baskets are another weakness of mine. Plus juicy scallops! 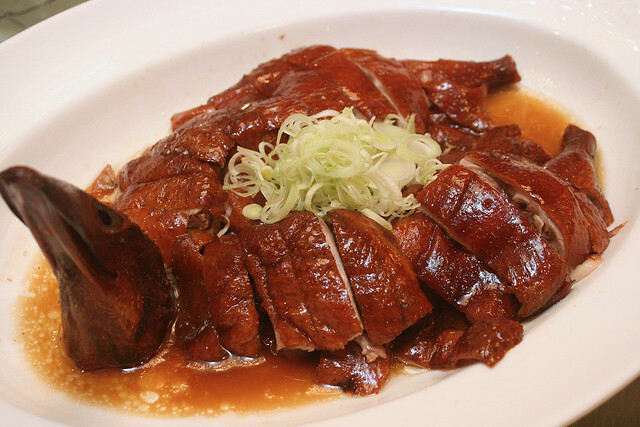 Whole Duck Roasted with House Special Sauce. I heard the parents specially requested this, and it was really good. Even my hubby who rarely eats duck said this was lovely. 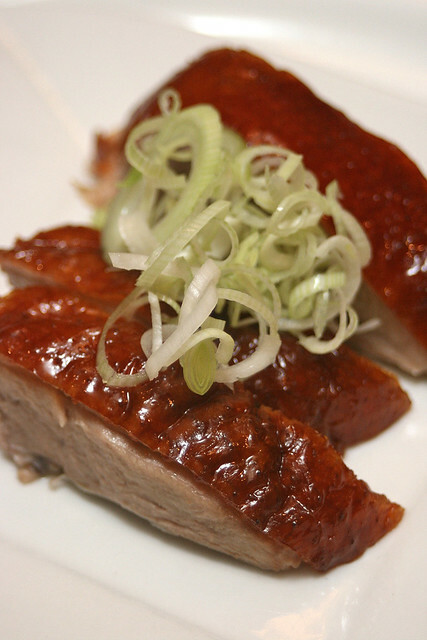 Close-up of the roast duck slices...fleshy and moist, very aromatic. 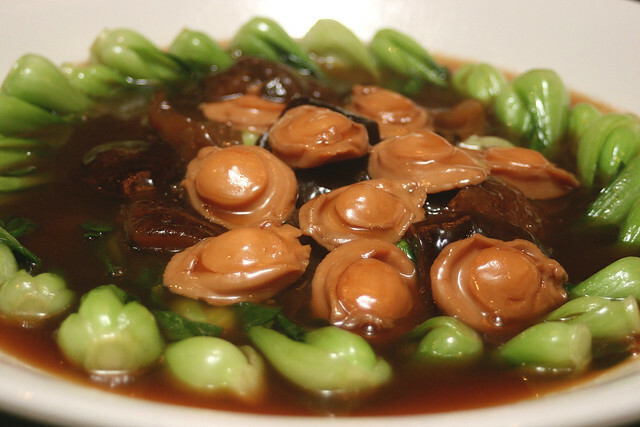 Baby Abalone Braised with Sea Cucumber and Seasonal Vegetable. I gave hubby all the veg, and he gave me all the sea creatures. Fair trade, I say! 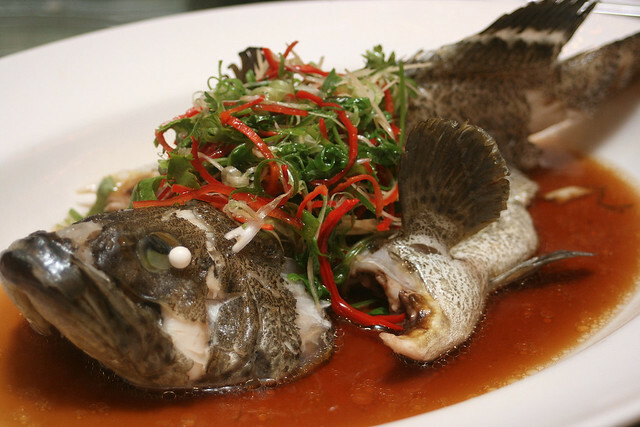 Garoupa Steamed with Superior Soya Sauce. Nicely done, with lots of meat to go around. 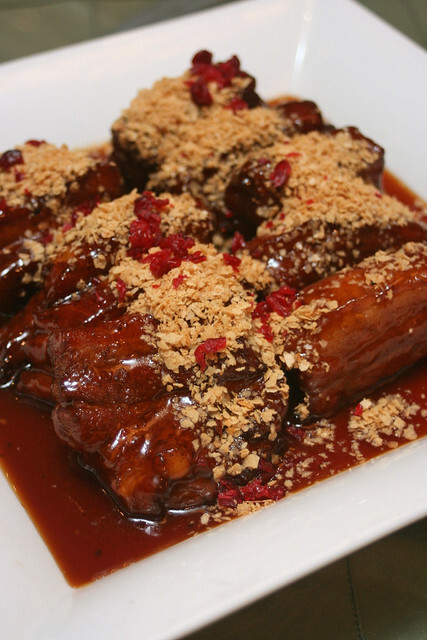 Pork Ribs Deep-fried and Glazed with Honey. Oh this was teh awesome! Probably my favourite of the evening. It was quite fatty in parts, but oh-so-delicious. Very, very guilty pleasure. Glutinous Rice in Beancurd Wrap. 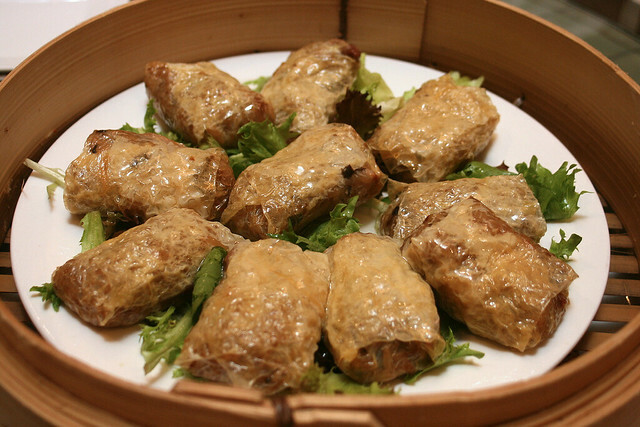 I had earlier wondered if this might be like inari sushi, but the beancurd skin is different. We were already quite full at this point, but I still enjoyed this. 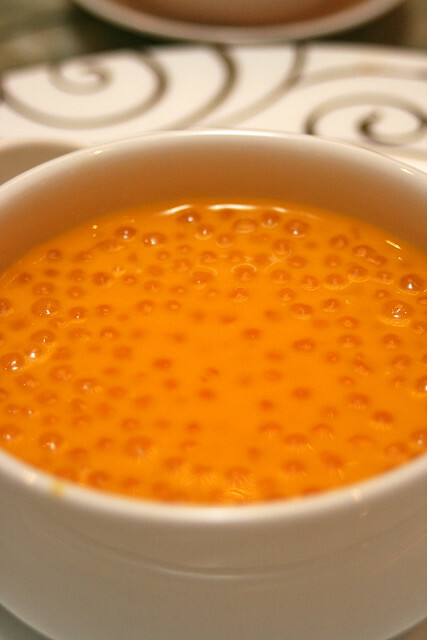 Dessert was chilled mango sago. It was certainly lots of mango and lots of sago! Not too sweet, so it was just nice. So nice to be with foodie friends. For a change, most of the food bloggers chose not to take photos but enjoy the evening instead. So we didn't have a barrage of cameras clicking at food like we normally do. Well, I knew Keropokman would probably not be able to take any food photos, so I just shot a few. We also got to try the wedding cake as part of dessert. It's all real cake, no fake layers. Congratulations, once again, to the happy couple! 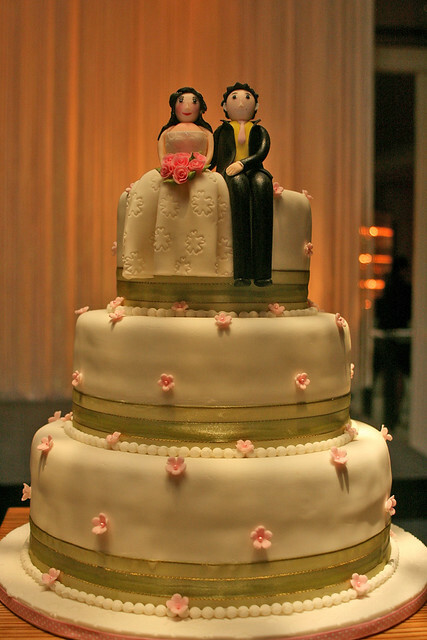 May your wedded bliss keep growing for years and years to come! Now you need to work on the 16 kids you've been tasked to make! TTC: ROFL! Indeed, how did we do without keropok!?! Miso: Thank you! Yes, that's the lovely Momo frequently mentioned on Keropokman's blog! Congrats keropokman and Momo.. sorry we missed your big day~! we had commitments in KL la.. bummer but you both look like a Megawatt couple! so nais:) and Hello ladyironchef, familiar face, too! I'm so glad I was there to celebrate the union. They're a wonderful couple. Also good catching up with you and the rest of the SG food bloggers! I love the cake! It's so cute. may i ask where this chinese dinner held at? Anonymous - eh did I forget to mention? Oh, it's in the second paragraph. Mandarin Oriental Hotel.